I've wanted to try a salt-crust for awhile, probably because I'm such a salt fiend. I have at least six varieties in my pantry (grey, pink, black, truffle, flaked, kosher, slab) most of which have been gifts from people who know me well. I salt almost everything. I even carry around a little baggie of it in my purse in case I'm caught with a takeout sandwich or salad that needs a little pop. With salt-roasting you bury the food (fish, meat, vegetables) in a sandy mixture of salt, egg whites and herbs. It creates an oven within your oven and cooks the food gently and evenly. When it hardens and browns you crack open the crust to reveal a tenderly cooked thing. 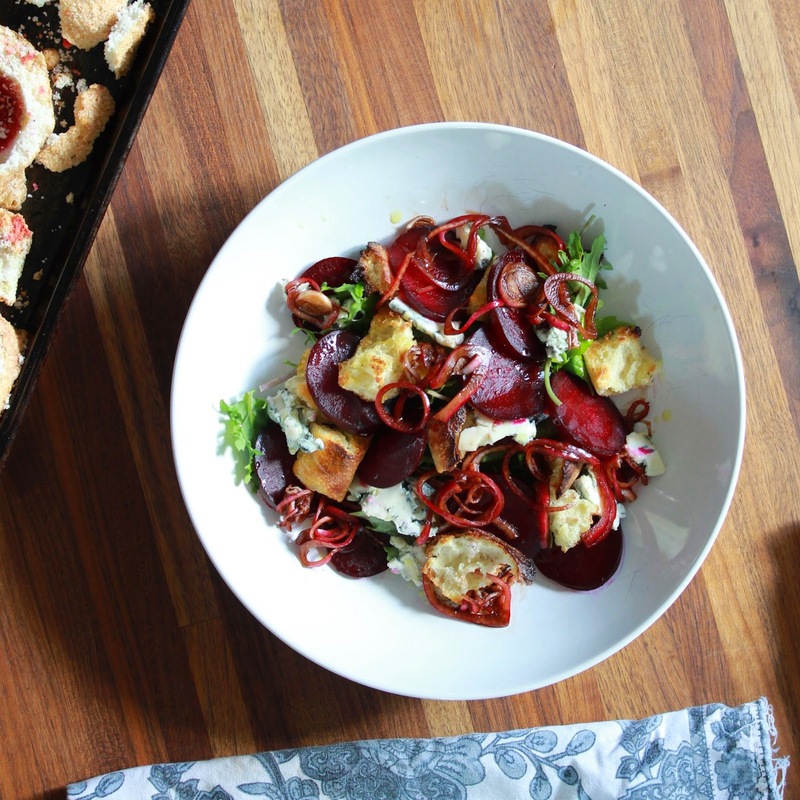 You blow a lot of salt and egg whites just to roast some beets. Fun to make the wet salt sand and shape it around beets. I had a small cut on my finger. Delicious. You can taste the salt and thyme throughout the beets. Is that really important when you're going to put these in a composed salad with pungent balsamic onions and gorgonzola cheese? I'd do this for company or when the beets are served on their own with a drizzle of olive oil or butter but not as my go-to beet making method. I'd also do it to get kids involved in cooking vegetables because it is kind of fun to both prep and break open the finished product. You could try this with carrots, potatoes, parsnips, etc. 2. Mix salt, egg whites and thyme together with hands until the texture is like wet sand. 3. Pack salt-sand mixture around beets, covering completely (important or you'll get tough spots). 4. Place on sheet pan and roast for 50 minutes. 5. Cool 10 minutes then crack open, peel and serve.